Sir Simon Rattle conducts his inaugural concert as music director of the London Symphony Orchestra with a programme of music by Elgar, Birtwistle, Knussen, Ades and Helen Grime. 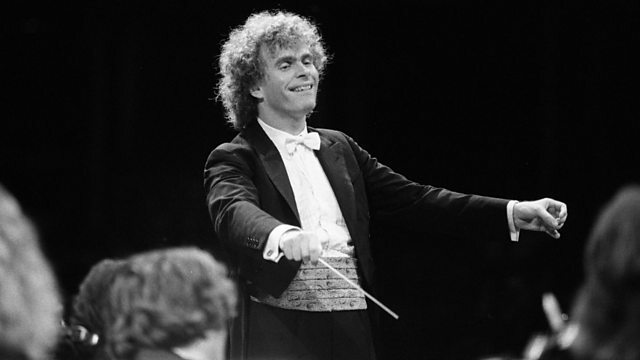 Sir Simon Rattle conducts his inaugural concert as Music Director of the London Symphony Orchestra. Presented by Martin Handley in the Barbican Hall and Georgia Mann in the Barbican's Sculpture Court. interval Music: performances by artists taking part in the associated concerts this week at LSO St Luke's and Milton Court concert halls. Elgar: Variations on an Original Theme, 'Enigma.'. Orchestra: London Symphony Orchestra. Conductor: Sir Simon Rattle. Performer: Christian Tetzlaff. Orchestra: London Symphony Orchestra. Conductor: Sir Simon Rattle. Performer: Peter Moore. Performer: Jonathan Ware. Performer: Esther Yoo. Performer: Zhang Zuo. Performer: Igor Gryshyn. Singer: Olena Tokar. Programmes and clips celebrating the conductor's return to the UK as MD of the LSO.